I’m really busy at the moment getting everything arranged for my exhibition and drawing project starting at the end of November. As such, I decided a few days ago that instead of spending a whole week (as usual) getting the studio tidy and clean, ready for our annual Open Studios Weekend next Saturday and Sunday, I’d carry on working up until Wednesday evening and then have two mad, mad days rushing around getting everything ready. Well, that was the plan. Yesterday however, it changed. I had a somewhat disruptive few hours and really wasn’t concentrating on the painting I was working on. This is always dangerous and it’s much better to stop working than to try and carry on ….and inevitably wreck the piece of work you’re doing. So, with several hours of the afternoon to go, I decided to start clearing all the stuff (boxes of pastels, tools, picture hanging cord, rolls of tape, boxes of nails, loose pieces of paper, old sketches……etc, etc , etc) off the top of my main table. This is always an onerous job as I only tackle it once a year…..yes; you’ve guessed it, the week before the Open Studios Weekend! Of course once I started it kind of created a chain reaction. Before I left the studio last night, my simple table-top tidying had already spread to moving paintings! As you know, I’ve been working on three 120 x 120 cm canvases, two of which are finished and the third that still needs plenty of work. This final painting will have to be packed away in the large box the original canvas arrived in. The problem is that I was planning to do some more work on it today, leaving a surface of wet oil paint. In order to make sure that I’m not tempted to reach for the paint brush, I took the canvas off the wall yesterday and it’ll be boxed up today! So much for my plan to carry on painting until the middle of the week! That said, I do have several small acrylic and pastel paintings on the go and so may well get a day or two working on them. I’ll just have to remember not to pack away my acrylic paints. This then is the run up to the Open Weekend. It’s always a bit crazy but thankfully this year Stephanie has taken on the job of organising the event and she is doing a great job. 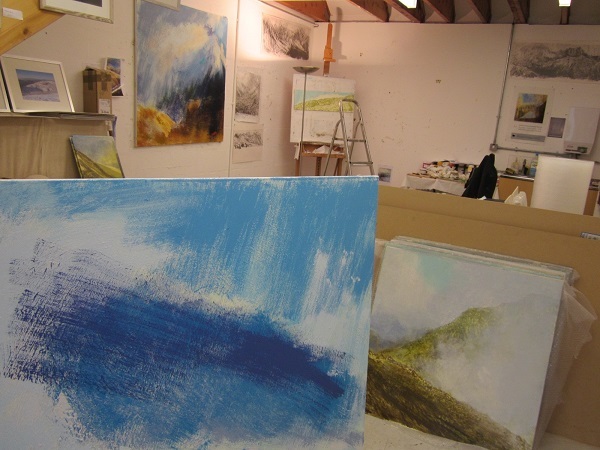 All I have to do is get my own space ready and myself down to the studio ready for an 11am start next Saturday morning. It should be a very good event this year with 14 out of the 17 artists taking part. This will mean a lot of very different work to see including all kinds of paintings and drawings, ceramics, jewellery, photography, hand book-binding and live music. Three of the artists will be running a workshop, talk or demonstration during the weekend…..check out the WASPS website for details. As usual the event is free to enter and everyone is welcome. We’re close to several very good bars, restaurants and cafes and the Magnum Sports Centre is just 2 minutes walk away ….so you can make a fine afternoon of it. Hopefully we’ll see some of you next weekend. Please spread the word. Thank you. Starting the pre Open Studios Weekend tidy-up!